Crochet baby blankets are very popular and there are so many out there! Here's a little pattern for you to whip up for the newborn in your life. This pattern is very simple and very easy to make. There are many on the web that are very similar to this with soft cluster stitches and thus is how I got my inspiration to make my own! I actually used a dish cloth pattern and turned it into a baby blanket. I'm not perfect at making crochet patterns but I hope all the information any crocheter would need is in here! Supplies: 2 skeins each of three contrasting yarns. 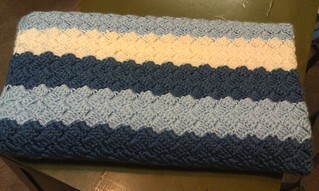 I used one of my favorite brands of yarn- Caron Simply Soft in Soft Blue, Royal Blue and Off White. Repeat row 3 until 34” or desired length. Like my patterns? Take a moment to make a donation to keep my patterns FREE! I love your color choice...very nice! This is a great pattern, thank you so much for sharing! Do you know how big the skeins of yarn need to be? (ounces or yardage would be great.) Thank you! Very nice blanket! Love the pattern! If I wanted to make it bigger how would I do that. Is the pattern multiples of 4 plus 2? Hi Brie! Yes, it is multiples of 4 plus 2! Thanks for the compliment! Granddaughter due in September. Her room is going to be gray and yellow. This pattern looks perfect. May start it tonight. May send you an email also if I need help. Is that ok? Would a light yarn ( a 3) baby sport work? May cause thinner stitches. If you have some of that yarn already, you could make a test chain to see how it works out. I've crocheted this stitch so many times into a baby blanket. It reminds me much of the "lazy st, or the slanted st pattern. Very nice colors. I am terrible at math. How many chain stitches for a full size afghan? Instructions say that it is 32" wide by 24-26" long; however, instructions say repeat row 3 until 34" or desired length. Is the length given a typo - should it be 34-36" long? Nice catch Jan! I double checked with my written instructions that I keep and it does say 34-36". Not sure where I got the 24-26 from! I fixed the pattern text though, thanks for the heads up! How many row of each color do you use ? Is the blanket two different ones ? I would like to make it a little wide and longer. Can you let me know how many stiches I would need to make it wider? I am so stuck at the ROW 3 start. I have taken this apart at least a dozen times and for some reason I cannot get row three to start correctly. Okay end of row 2 sc in last sc, ROW 3 CH 3, 4DC IN FIRST SC,*(sc,ch 2, 4 dc) all in next ch 2 sp, repeat from * across, sc in last sc. There does not seem to be enough stitches to get the (sc,ch2,4dc) to reach the next ch 2 sp? are the shells supposed to be squished together so much to the point of pushing the 2nd row to the back or forward because the last dc then goes to a sc in the next ch 2 sp and it does not seem long enough. PLEASE HELP...I must not be reading the pattern correctly or not doing the pattern properly. The clusters that you are making lean forward on the rows. The 4 double crochet that you do at the start is the thickness needed to make it to the next ch 2 sp. Essentially, you are making the clusters (the sc, ch 2, 4 dc) into the ch 2 spaces of the clusters in the row below. I hope this helps you Mimi! yes I was wondering the exact same thing! I did a little sample swatch right now, and the pattern is GREAT! I left my top scalloped and the bottom straight, for my design. You are welcome to play around with border ideas for your completed project; wouldn't mind seeing some photos! Are the sides straight? I am having trouble on row 3. It seems like if I do the 4 dc in the first sc then it sticks out too far on the side. I can't get past row 3 because I don't want to keep going if its wrong. I'd appreciate any help! Love this pattern...making one in yellow.green.lavender and pink 4 a friend who is due in august. ..
great pattern! BUT how about finishing? Needs some type of a border, no? I love this pattern! So do you count the row of single crochets as one of the four rows for the first color? I used the darker blue in my chain and first row. Love this. But confused about end of row 3. Is sc in last sc really sc in top of ch3? I have that question too! Do I go through back stitch or both when making blanket...I have this pattern from a friend and neither patter tells that I can find. Thanks! 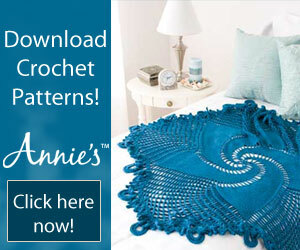 A typical crochet pattern is always in both loops. If it is in back loops or front loops only, it would/should be indicated. Mine is both loops. Am in the middle of row 3, and already the strip is begin to curl up along the foundation chain. I did the chain a little more loosely than usual (guess I should have used the next size hook), but I still find the curling up happening. Wanted to ask - is this expected? Will it straighten out as we build more rows? AM making this as a gift, so would love to get everything right and ready for friend's new squish! Sorry I missed your comment. There is a link on the pattern to a second page that walks you through the steps for creating the stitches and beginning a new row. There shouldn't be any curling. I hope this helps! Thank you so much for the pattern.... I made it for a gift and it was well appreciated! Hi. Love the pattern. Making it in winter white/navy/robin egg. Looks very nice. Do I need your permission to sell my Afghan? Also would a row of single crochet and possibly a row of slip stitches be a good ending to resemble the beginning? Started it with the navy so would like the top to have a more polished look. Although the scallops look nice too. For your beginning row, so long as it's the right multiple of stitches to complete the pattern, you should be fine. As for selling your made blanket, I don't put silly restrictions like that on my patterns. You paid for the yarn, you did the work. You may do as you please with the final product. Just wanted to let you know I also made a scarf with this pattern stitch using robin egg, navy, sable, and yellow. Since the scarf is much longer than the afghan, I made some color sequence changes. It turned out quite nice. For the top (or end) I ch 2, turned. Then half double crochet across top of stitches making 20 hd crochets, ch 1 turn, slip stitch across the 20 hdc, then finished off. Matched the starting 2 rows amazingly close. Would you like to see a picture of it? By all means! Share your picture! Hope on over to www.facebook.com/MissedStitches and post your photo! Hi. Just finished the afghan too. Will see it I can get pictures to your mentioned website. Just saw this and had to try it. Your directions are great and I'm having no problems. I'm using 5 colors and figured it out perfectly. Love the pattern and have already shared it with my daughter and my sister. Project Linus is going to love you lol. I made this blanket for a woman at work. It came out great. Easy and quick to work up. The only thing I changed was on the start of the last row. I chained fewer stitches. I didn't want it to have the "sticky out" look that was on the end of all the rows before picking the stitch for the next row. The woman was very happy with the blanket. I am so glad I found this pattern. Thanks very much. Hey Shelley! I made a blanket with this pattern and wanted to share it. Where is the place to do that? Thanks! 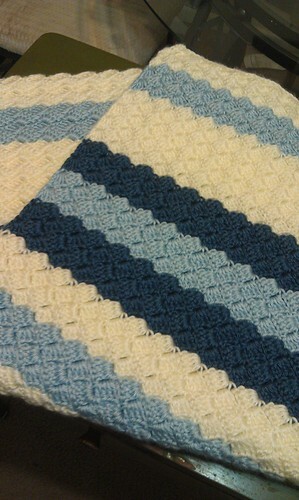 Hey Shelly, I also made this blanket, but I added a border. I would like to send you a picture to see what you think of it. I have a pattern so very simular and I have always used it as my go to whenever I need something in a hurry. I am really looking forward to trying yours too. It is really a nice stitch. Can I sell the blanket from this pattern? You absolutely can! Your supplies, your time- your blanket to do as you wish! Hi Shelly. Love the blanket! I just finished a baby blanket using this pattern, but I wanted to add a border. The colors are country blue, lt. country blue, white, and gray. It's for a baby boy so I don't want it to look too girlie. Do you have any suggestions on what type of border to add to this blanket? Hi Shelly, I love your pattern! Made one with variegated baby yarn for my great granddaughter due next month and have been asked to make another for a friend. I've crocheted this pattern three times now and every time I have to undo it and start over. I chain 122 and by row three, my blanket it bowing so bad and when I stretch it out straight then it bunches up. When I lay it flat, it makes like a semi circle. I'm an experienced crocheter, I know I am not adding stitches or losing stitches and my initial 122 chains are not too tight, I can't figure out where I am going wrong. I've had trouble of this in the past when the second row is just sc so the second time I started this, I left it out. It bowed less but it was still too much were I had to take it out again. is this something that would correct itself as the rows get longer and the blanket gets heavier so it pulls up on the sides and makes it straight? 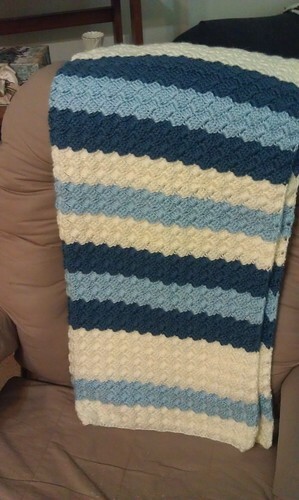 If the Soft Bobbles Help page didn't help you, send me a photo of the blanket to missed.sitches@yahoo.com. I'll see if I can fix your issue! I had been trying to find a pattern to use for a THIN BLUE LINE lapghan and was not successful until I cam across this pattern. Our county lost a deputy sheriff in the line of duty and it was a very traumatic time. This became my ‘therapy’. The pattern is easy to follow and allows so much flexibility in the size. I have modified the number of stitches and rows a number of times. 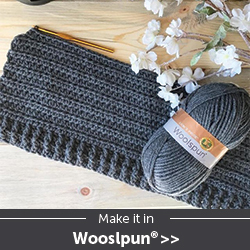 I use good old standard worsted (this is really helpful as the basic colors of RED HEART do not have a dye lot and it is easy to change your mind on how big you want the lapghan and purchase extra yarn. The yarn is easy to find and easy to keep clean. I always include one of the yarn wrappers when I ‘gift’ the afghan so that recipient has the washing instructions. I started with a size J hook, but have settled on using a K. My first ‘creation’ was 110 stiches (which ended up 36” (27 ‘shells). After the initial 2 base rows, I did 41 rows of BLACK, 6 rows of ROYAL BLUE, and 41 rows of BLACK. I finished with a row of single crochet (it .ends the project with a bit of a straighter row). Changing the size of the project is easy. I am currently working on one that is NAVY and GOLD for a NAVY Vet friend and I decided to try the GOLD line ‘off center’ rather than in the middle of the lapghan and I did a few more GOLD rows. Also, my college age grandchildren helped me create the right size lapghan (for them) for a football game. The length became the width (cozy for two) and the width became the length (long enough to be warm, short enough not to drag on the ground to much and need to be washed after every game). School colors are pretty easy to find in worsted yarn. THANKS for the GREAT, QUICK and EASY pattern. I love this blanket! Working on it now. My only question is how do I end the blanket so that it matches the beginning? This was one of the very first blankets I designed and made. I never tried borders back then so I never really made one for it. Some comments on here suggest doing hdc, dc's to even out the end. tried this pattern--disclaimer--I have great difficulties with crochet patterns--with that being said, I love the pattern---but it didn't work for me. each row was longer than the previous one, so I ditched it after row five. Wish I could have made it work. I'm sad to hear that. Was this the result even after trying to follow the step-by-step photos on page 2? I just tried a small sample to see if I could help ev1 that may be a bit confused. First, at end of each row, sc in last st. Turn your work. Next, ch3, 3dc in first st (first stitch is sc from previous row), then follow remainder of pattern to complete row. Ch3 counts as first DC and will create a more even edge. Hope this helps ev1. Happy crocheting!